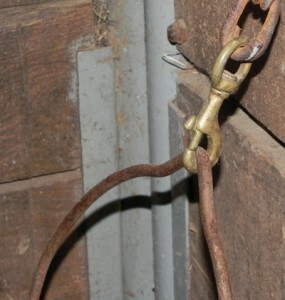 The “trigger” on your snaps should face the wall, so that the horse won’t catch his face or other body parts on it. The headline of this post might be rather long, but the sentiment is something you should remind yourself of daily. It’s your job, as a careful horse person, to think about all the myriad ways your horse can injure himself, and avoid as many of those ways as possible. 1) Snaps face in. Pay attention to how you hang your snaps, and keep the trigger — that little sticky-out part that gives your thumb something to hang onto — facing toward the wall. It does make it a little harder to hang up a full bucket of water, I know, when the snaps face that way, but we’re not worried about how hard it is. We’re worried about how safe it is. Nope! This snap has the trigger facing out, toward the horse’s delicate face. Wrapping a little duct tape around the ends of the bucket bail will help the horse avoid getting his mane, tail, or other more important body parts stuck in the loop. 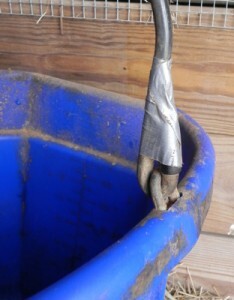 2) Duct tape on bucket bail loops. Here’s another thing to think about, when working with your standard feed/water bucket. The metal handle-thingy is called the “bail,” and the end of the bail passes through a loop in the bucket and turns back on itself. That little loop can cause all sorts of problems. 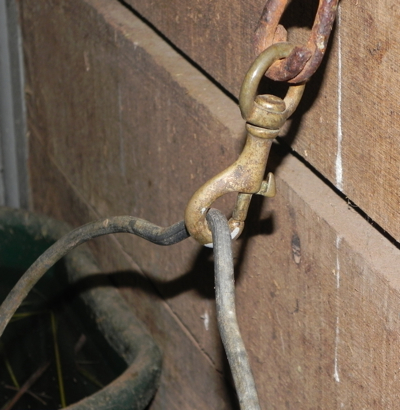 The most common problem with the loop is that your horse will get his tail caught in it. It’s quite depressing to walk in the horse’s stall and see a big chunk of tail hair stuck in the bucket bail. 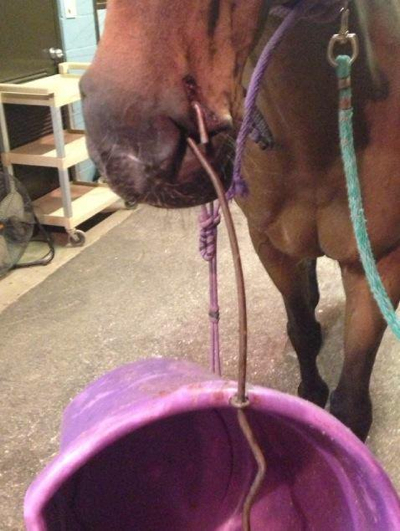 It’s even MORE depressing to see your horse’s whole nostril stuck in the bail loop! The picture below — which isn’t too gory — shows the extreme of what can happen with a bucket bail loop. A little duct tape on the bail might have prevented it. This entry was posted in general horsiness. Bookmark the permalink.